Zillow’s Zestimates, the machine-made home value assessments, put Zillow on the map. Without these controversial algorithm-produced appraisals, Zillow would be a home search engine just like all the others. By and large, real estate agents hate them and homeowners swear by them — or at them — depending on how their home value goes. 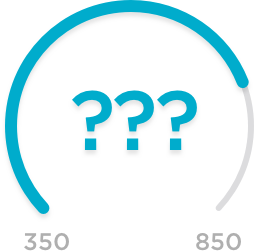 How accurate are Zestimates? Here’s what we found. Zillow says Zestimates currently have a median error rate of 8%. That may seem to be a large margin — but it has improved. The algorithm began with a 13.6% median error rate in 2006, according to Zillow. However, error rates can vary widely, depending on where you live. 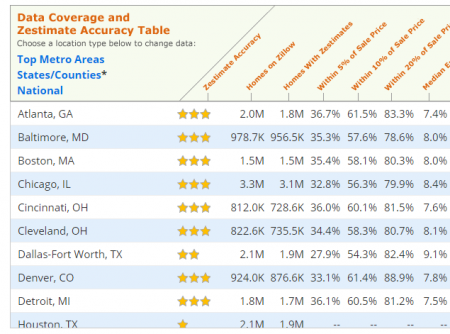 In the top metros, Zillow says accuracy ranges from a median error rate of 5% in Washington, D.C. to 9.5% in Pittsburgh. In some cities — including Houston, Kansas City, San Antonio and St. Louis — Zillow is unable to produce a Zestimate error rate because of state real estate disclosure laws. However the Zestimates are created, Zillow says between major upgrades new iterations of the model are constantly being devised. And since Zestimates were introduced on the site in 2006, the company has deployed three completely new versions of the algorithm, in 2006, 2008 and 2011. “Home characteristics, such as square footage, location or the number of bathrooms, are given different weights according to their influence on home sale prices in each specific geography over a specific period of time,” Zillow says. The site also mixes in property tax information and prior sale prices for a home, as well as for others nearby. But the accuracy of the home value estimates is hotly debated. Zillow says it calculates the accuracy of its “proprietary automated valuation models,” or AVMs, by taking a home’s final sale price and comparing it to the Zestimate on or before the sale date. The Zestimate is now just one of many AVMs available on home search sites and in the real estate industry. The old saying “If you can’t beat them, join them” seems to apply. Developers are frantically trying to outdo one another by cobbling together new variations of black-box home price estimates. AVMs can’t determine the actual condition of a house. Has it been recently renovated — or is it in dire need of an upgrade? AVMs account for the number of bedrooms, baths and the total square footage, but these don’t always correspond to a higher or lower price: Sometimes a bathroom is poorly located, or a bedroom is tiny. AVMs don’t usually take into account title defects, permitted versus unpermitted structures, and other property nuances. Physical characteristics that impact local demand and value — such as architectural style, year built, and layout and flow of a home — cannot be factored in. 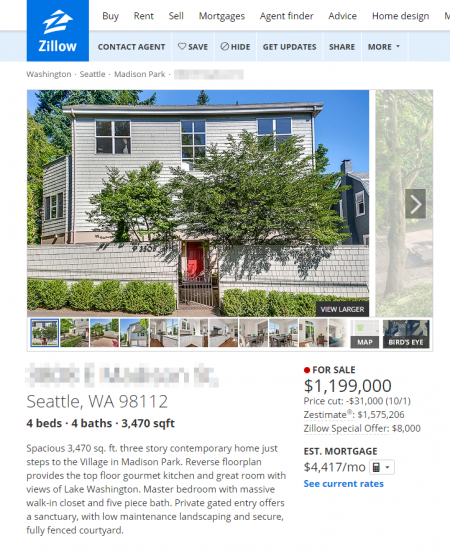 To see a Zestimate at work, consider the fact that in July of this year Zillow Group CEO Spencer Rascoff listed his four-bedroom home in Seattle, Washington, for $1.295 million. At the time, the Zillow Zestimate valued the home at about $1.39 million. That’s over 7% higher than the list price, but within the Zillow median margin of error. “My hope is that the public is getting pretty smart about how Zestimates actually relate to home values,” Stephenson added. Since then, the home’s price has been discounted $96,000. Meanwhile, the Zestimate has risen by $185,000 to $1,575,206. Go figure.